On Sunday, September 28th, we held a ceremony to dedicate and place six new Leaves of Remembrance at Ballard Commons Park (57th NW/NW 22nd), during the Sustainable Ballard Festival. The new Leaves honor Jeffrey Parker Bouck, Kenny Stoddard, Will Johnson, Cecil “Marty” White Face, Michael “Mike” Sheely, and Marvin “Marv” Hosking, Jr. We also rededicated a pre-existing Leaf for Karen Lee Pedersen. We were honored that the Stoddard family traveled 350 miles, from Orville, Washington, for this dedication ceremony. Gerry Stoddard speaks of Kenny. Jean Darsie sweeps the sidewalk before the dedication. Knew every person for whom we laid a leaf. Child looking at the Leaves. Pastor Kelle starts the dedication. Pastor Kelle with the Stoddard family. On Wednesday, September 24, 2014, following a Women in Black vigil, we laid a Leaf of Remembrance for Daryl Ford alongside several others in front of the Seattle Justice Center. His sister Connie remembers him as a gentle man who enjoyed the simple things in life, especially ice cream. We stood vigil for Mr. Ford earlier this year. Women in Black standing vigil for Charles Gott while Connie Ford holds her brother’s Leaf. Gathering together to remember Daryl Ford. Connie Ford chose the placement of her brother Daryl’s Leaf. Pastor Kelle Brown of Mary’s Place led the powerful and moving dedication and blessing. Connie Ford with her brother’s Leaf of Remembrance. ALL ARE INVITED TO WITNESS AND CELEBRATE the September 28th dedication of six new “Leaves of Remembrance” around Ballard Commons Park (where 25 Leaves already are). We’re remembering these beloved community members: Jeffrey Parker Bouck, Kenny Stoddard, Will Johnson, Cecil “Marty” White Face, Michael “Mike” Sheely, and Marvin “Marv” Hosking, Jr.
We’ll also rededicate/place a pre-existing Leaf for Karen Lee Pedersen. The event starts with a 3:30 PM Ceremony at the Park–yes, this’ll be during the “Sustainable Ballard” Festival! Then there’ll be a chance to share stories, memories, and refreshments at a Reception hosted at the nearby Bridge Care Center (at St Luke’s Episcopal Church, 5710—22nd Avenue NW). Please join us! On August 27, 2014, we laid new leaves to honor Lori Dillon, Jennie Wilcox, and Anna “Soso” White at Angeline’s and Lynda Van Sant and Joyce Van Hollebeke at Noel House/Bakhita Gardens. Below are photos from the ceremonies. Anna “Soso” White’s friend at Angeline’s. Anna “Soso” White’s friend with Anna’s Leaf. Gathering together at Bakhita Gardens. Joyce Von Hollebeke’s sister Eileen at Noel House. A crowd gathers around Leaf-Affixer Doug. On August 22nd, we laid five additional leaves in Pioneer Square. Abel Gonzalez and Brandon Jeffrey Mickelson were honored at the Compass Housing Alliance, and Gerald “TC Willie” Aust, Patrick Joseph, and Arthur Lee Lassiter were each honored at DESC. Family of Brandon Mickelson gathered around his leaf at Compass Center. Laying new Leaves at DESC. Pam with friend Patrick Joseph’s Leaf at DESC. On July 25, we laid 19 leaves at the Sobering Center. Thank you to all who participated in this beautiful ritual and a special thank you to Marty who led a Native American blessing as our closing. Marty begins the Native American blessing. Doug laying out the Leaves. Verlon Brown of the Dutch Sobering Center, Pastor Marcia McLaughlin, and Pastor Kelle Brown of Mary’s Place. The prophet Jeremiah, in Lamentations 1:12, read as part of the dedication ceremony. It was a lovely bright fall afternoon Sunday, October 13, when almost 100 people gathered at the southwest corner of Ballard Commons Park to dedicate 25 new Leaves of Remembrance. Some were from the faith community, social services, and various professions. 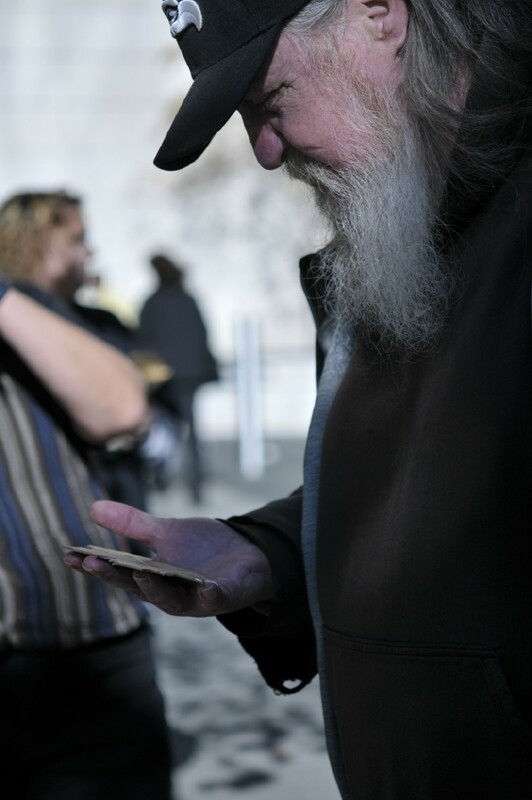 Many were homeless, there to honor friends loved and lost on the streets. One woman walked to Ballard from downtown Seattle, for the chance to see her friends publicly recognized with a bronze Leaf. 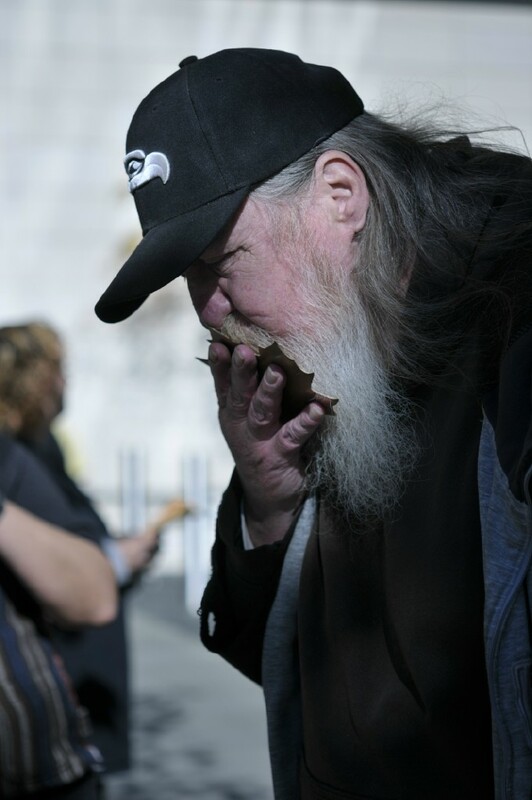 Wednesday, September 11, 2013, the Homeless Remembrance Project dedicated four new Leaves at the Seattle Justice Center, after a Women in Black vigil for nine recent homeless deaths. On Friday, August 30th, we laid five Leaves in Pioneer Square in front of the Real Change Office and in front of DESC. The Leaves honor Reginald “Reggie” Thompson, Geraldine “Geri” Jones, Crystal Miranda, James “Jimmy” Mayo, & Kathy McNeilly. Array of Leaves at DESC. Buddy speaks of Reggie Thompson. Dawn speaks of her friend. Nancy McNeilly pointing at her sister’s Leaf. Neil of Real Change cleaning a Leaf. On Wednesday, August 28th, we laid down six Leaves in Belltown, at Angelines and at Bakhita Gardens. The Leaves are in remembrance of Karen Camy, India Valdez, Sarah Fraillon, Roxanne McDonald, Charlene Downey & Monica Erickson. Andie and Sheri at Angeline’s. Doug replacing a mis-spelled Leaf. Karen Camy’s friend and Karen’s dog. Reception and Bell Street Boulevard. Ruanda with Karen Camy CD. Teresa singing a song for Monica. On Wednesday, October 10th, we dedicated forty leaves at Compass Center, Real Change, and DESC. These are photos from those dedication ceremonies. Dedicating Leaves outside Compass Center. Pastor Linda Smith leading us in the dedication at Compass Center. Sharing stories at Compass Center. Walking down the alley to Real Change. Tim Harris speaking at dedication at Real Change office. Marcia McLaughlin leading dedication at DESC. Stories being told about those who died. A few of the Leaves we dedicated in Pioneer Square. Gathering for the reception in the Morrison. Enjoying food and telling stories at the reception. About 60 people gathered together on June 23, 2012 at the Seattle Mennonite Church in Lake City to remember friends and loved ones who had died. Because of the weather, we weren’t able to actually affix the leaves in the sidewalk until a few weeks later. People who knew those who were being remembered read the names and shared stories and memories about their loved one. Sally Kinney led the group in a stone blessing rite, which was a wonderful celebration of the lives of 14 people. Sheila, who shared beautifully about how Eva helped her learn to celebrate color. Leaf for Karen Marie Boyle. Carol and Melanie leading the ceremony. Individuals read the names of loved ones and placed their Leaves on the sidewalk. Sally placing stones on the Leaves. All of the Leaves with stones. 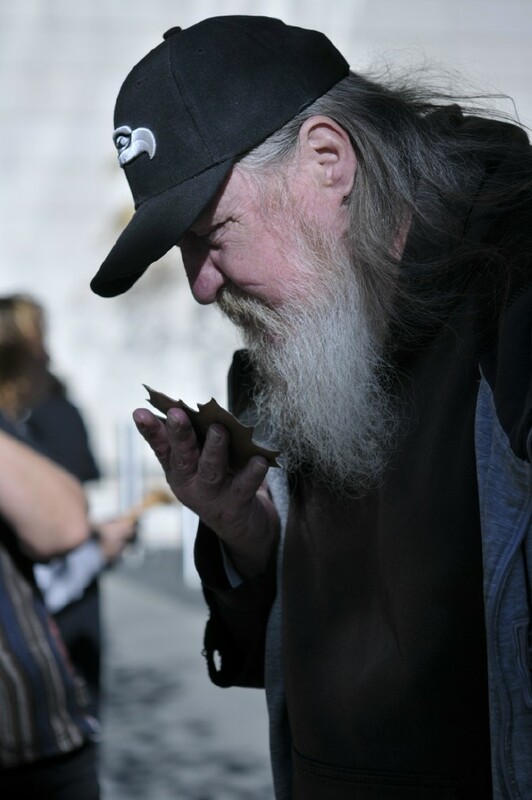 On October 18, 2011, the Homeless Remembrance Project dedicated 13 Leaves of Remembrance at the WHEEL/Women in Black Vigil Site outside the Seattle Justice Center (at 5th/Cherry). On August 16th, we dedicated two more Leaf installations, with 15 Leaves in front of Angeline’s/Opportunity Place, and 11 Leaves in front of the Family and Adult Service Center (FASC), on 3rd Avenue between Lenora and Virginia Streets.